Francois-Philippe Champagne spends his time telling U.S. officials one thing: "We are your largest client." In the baking Ohio heat Canada's trade minister is trying to save NAFTA, one encounter at a time. 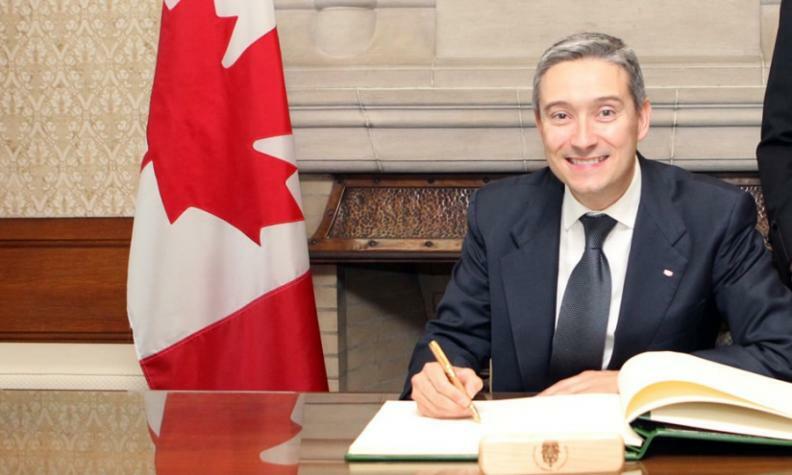 Francois-Philippe Champagne is in Cincinnati for a meeting-packed June day as part of a concerted Canadian outreach campaign ahead of talks to renegotiate the North American Free Trade Agreement. U.S. President Donald Trump describes the 1994 pact as a disaster and has threatened to walk away from it. Concerned that any moves to abandon NAFTA or curb trade could cost thousands of jobs, the Liberal government of Prime Minister Justin Trudeau wants to remind Americans how important bilateral trade is while seeking allies to press the Canadian cause if threats emerge. Vehicles and auto parts alone accounted for more than one-fifth of all traded commodities between Canada and the United States in 2016, Statistics Canada said June 20. The total value of auto trade between the two countries was about $134.5 billion last year alone, the government agency said. The auto sector was the biggest driver between Canada and the United States. Since Trump's inauguration, Canadian politicians and officials have made almost 160 trips, meeting 14 cabinet members, almost 200 lawmakers and more than 40 state governors and lieutenant governors. Mexico, the pact's third partner, has been leading a similar campaign. "We have to hammer, hammer, hammer away at this and when we're exhausted, hammer again," said one person involved in the Canadian effort. Champagne's message is simple: "We are your largest client." Every day some 400,000 people and C$2.4 billion ($1.82 billion) worth of trade cross the border. Crimping that flow will hurt both nations, says Ottawa. In all of Ohio, more than 300,000 jobs depend on trade with Canada, Champagne notes. To help drive home the point, Canadian officials drill deep into the data. For example, their analysis shows that in Ohio's first congressional district, 17,269 jobs depended on Canada-U.S. trade and investment, with exports exceeding $1 billion. The auto industries of Ohio and Ontario are well integrated, contributing to $39 billion worth of merchandise trade between the two in 2016. Champagne, who flew in late the night before, starts his day at Cincinnati's members-only Queen City Club, where he hosts a breakfast with a dozen local leaders. "Sometimes as friends and neighbours we take each other for granted," he tells the group. "Let's make sure we don't put things in place that would disrupt supply chains." Reuters was granted exclusive access to the meetings during Champagne's trip. Lawyer Daniel Ujczo, who specializes in Canada-U.S. affairs, tells Champagne his clients' biggest complaint is red tape that makes it hard to transfer specialists across the border. "I don't think companies will see a NAFTA win unless we address this," he adds. Shortly afterwards Champagne tells a business forum of around 150 people that the greater Cincinnati area sends 20 percent of its exports to Canada. Diplomats hand out leaflets underlining the closeness of trade ties. In the car heading for his next appointment, Champagne reflects on the audience and tells aides: "They don't know many of the numbers." That feeling is only underlined at a lunch with local politicians. William Seitz, a Republican member of Ohio's House of Representatives, admits afterwards his constituents know little about free trade. "Folks don't understand as well as they should that when we erect barriers to trade with foreign countries, we are increasing prices for domestic consumers," he says. Champagne is willing to use any hook to make a connection. He studied in Cleveland and in every meeting notes a local politician once called him "a son of Ohio". Later in the day he presents an honorary certificate to Joey Votto, the Canadian star of the Cincinnati Reds baseball team. "You're our best export," Champagne says as cameras click. As his car speeds from the Reds stadium to another appointment in the late afternoon, he says: "It's been a great day ... We've made a small difference." Officials track the number of trips and how many people they meet, but say ultimately what counts is whether their new-found allies will step up to defend trade with Canada. When Trump announced in April he might tear up NAFTA, "you had many Republican senators calling the White House and calling Trump to say 'This is crazy'," said another person involved in the campaign. Some of the callers had already been approached by Canada as part of the effort to contact influence-makers, that person said. The outreach effort is not intended to convey a threat, says David MacNaughton, Canada's ambassador to Washington. But he adds: "It doesn't take a rocket scientist to figure out that at some point, if they keep doing things that harm Canadian companies, that it's going to be difficult for us to resist doing the same." Canada initially chose to focus on 11 states, selected for their economic and political importance. These include Indiana, home of Vice President Mike Pence. The Canadians are "talking to people who talk to Pence", one official tells Champagne.